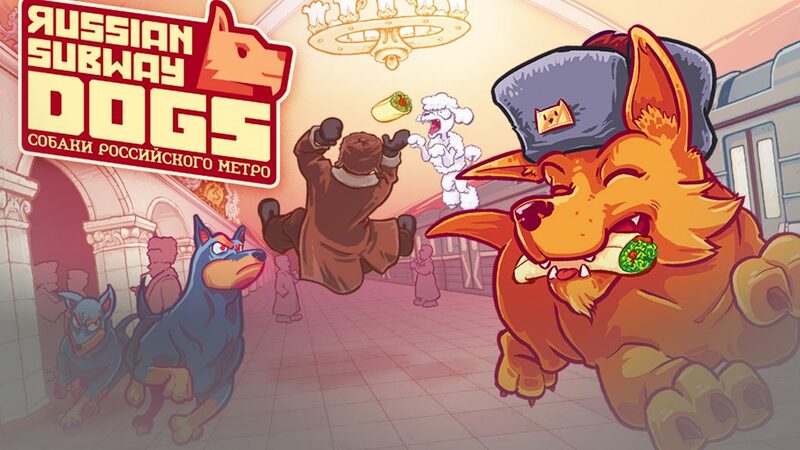 Russian subway dogs is a 2D fast paced arcade game that was created by Spooky Squid Games Inc. a Canadian indie developer. They have created some free games in their background and now they have multiple projects running on steam. There are lots of dogs and other animals that actually live in Moscow subway system. They have learned to use this system to reach other locations in the city and also lots of them live in the subway. They managed to earn passengers trust and even capture food from them. This was the inspirational concept of Russian Subway Dogs. In this game you play as different characters that have one common point, they will do anything to find foods from subway passengers. The Russian dog is the main character but gradually you can unlock other characters as well. Timing and twitching are the main abilities that this game works with. Easy to play, hard to master. This is what makes lots of games great which one of them is Russian subway dogs. The game have two main mechanics, barking at people and jumping. When you bark on people correctly they throw their food on the air, now you must collect the food before it reaches the ground and that multiples your score for next food. This is a chain which means you can reach to a very high level of multiples but if you miss and food reach the ground, you will lose all you multiples. That where the hard to master part glowing, Because you can not even finish the first level without reaching certain level of multiples. Finishing a level with rank D is usual that will send you to the next level but it is not even close to the high ranks, so don’t expect an easy game. It is not easy but very addictive and with some practice you can reach good ranks and scores. Personally I tried a lot and in some cases I could do the job. For example check out this perfect cabbage catching that felt so good! The gameplay is not so complicated but there are many details that can make differences a lot. For example, each passenger have different type of food and throwing pattern. One of them like cabbage guy from previous GIF throw 4 things including 3 foods and one explosion so you must be careful if you want to collect them perfectly. Another passenger throw 5 small food in a curve shape pattern. It is hard to collect them and need perfect timing. But reward is 5x for your multiple that really great specially for your next food. You can see a collection of some passengers activity here. Also, there are lots of enemies in the game that designed brilliantly. All of them are other animals that trying to steal food from you. Even some of the passengers defend themselves from your barking. Losing your multiple and score to an enemy that reach the food sooner than you is painful. This is my personal advise, never active a passenger despite you know you can collect all the foods he throws. In the higher levels there are enemies that activate passengers automatically, so you must be quick or lose! You can eliminate enemies by using other hazardous objects like explosive bottles. Have a look on some of these enemies. A light humor is flow in the game. Names refer to other famous words for example peroletaricat which refer to proletariat that is a social class for working people in ancient roman empire. Other playable characters are also available that deepen the game concept. The developer tried to present a game with an acceptable concept that I can tell you they were successful but bear in mind that the gameplay is the winning card for this kind of games, the area that Russian subway dogs works on it perfectly. Graphics is in harmony with other parts of the game and as a 2D game its aesthetics is in standard level. Characters designed to complete the concept of the game. For example blue Russian cap on the dog’s head is a perfect symbol for Russia and its soviet background. Moscow’s subway is famous for its beautiful stations that were built by Russian artists. You can find a glimpse of that beauty in the art of this game too. Music is composed by Peter Chapman AKA Coins which is a Canadian music artist and famous for his album Daft Science. The music is totally synced with the pace of the game and player enjoy hearing it while playing. Also, Russian melodies and rhythms make the atmosphere perfectly matched. I don’t know why but the music reminds me, the original Tetris music. The game may seems a little hard at the beginning but after some exercise you can find it entertaining and highly playable. It is totally expected that you repeat and repeat to achieve higher scores, a process that is really enjoyable. I must admit that this game is better than what I have expected before playing it and is a step forward for its creators. Core Gamer since Duke nukem 3D. Your welcome and really appreciate it.